It’s that time again to get out the Christmas decorations. There are a lot of people out there who enjoy going all out to do a light show with choreographed music themes and moving lawn ornaments to match. With an aging population, this may not be possible for all of us. And, getting up on ladders may not always be practical for everyone especially if you have a fear of heights. However, many of us thoroughly enjoy this time of year and we want to participate in the merriment, the coming together of people as well as all the good tidings of joy and peace. Here are some ideas for how to decorate the garage from the outside while using the garage for storing decorations again in the new year. The overhead space is the best place to store things we use only once or twice a year. Or, we may want to store summer garden tools in the overhead space during the winter and early spring when we need to use winter tools to maintain the driveway and yard in these colder seasons. Overhead platforms offer open storage space where it is fairly easy to see what’s up there and it is only a limited distance of 18 to 24 inches to the back or furthest reaches of the platform. They come in a variety of formats including made-to-measure wood platforms with pot lights installed to illuminate work spaces below. There are also metal shelves which are mounted against the walls or platforms which hang from the ceiling and can still carry hundreds of pounds of belongings as long as it is properly secured to the ceiling. And, for garages with a high ceiling, a mezzanine makes using the storage space above a lot easier. For the smaller items such as strings of lights or delicate ornaments, clear plastic storage bins are a great way to store and manage the decorations available. They not only store well on overhead shelves or platforms, but they help the family to seethe available decorations available so you don’t end up with duplicate items which go unused each year due to a lack of space. We often will hang a wreath on the front door and add decorations around the front steps or porch. Often, we forget the garage door yet this door may be a large part of the presentation of the front of the home. Keeping with the theme that we might use for the front entrance of the house, we can add garlands along the top and down the sides of a garage opening. Wreaths can also be used on the garage door or along the opening of the garage by hanging them over the outdoor lighting fixtures or sconces. These days, garage door wraps are available for garage doors of all sizes. They come in a variety of Christmas themes from peaceful to fun and frivolous. Depending on your style, a garage door wrap can match the style of your lawn ornaments. Whether you go to the extent of having a nativity scene or reindeers with Santa, a garage door wrap can stand on its own or compliment the whole theme of the outdoor landscape décor. 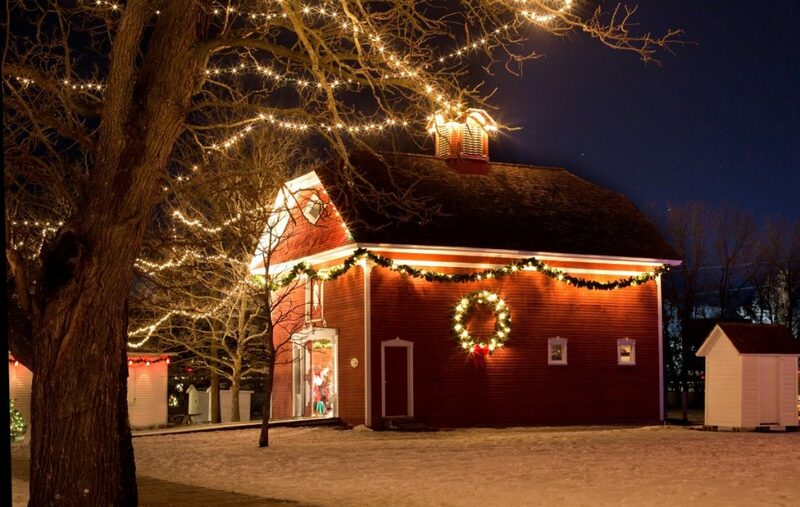 Still keeping it simple, if you don’t have the ability to get on a ladder and string lights around the house, you can always add a little light along the sides of the driveway. 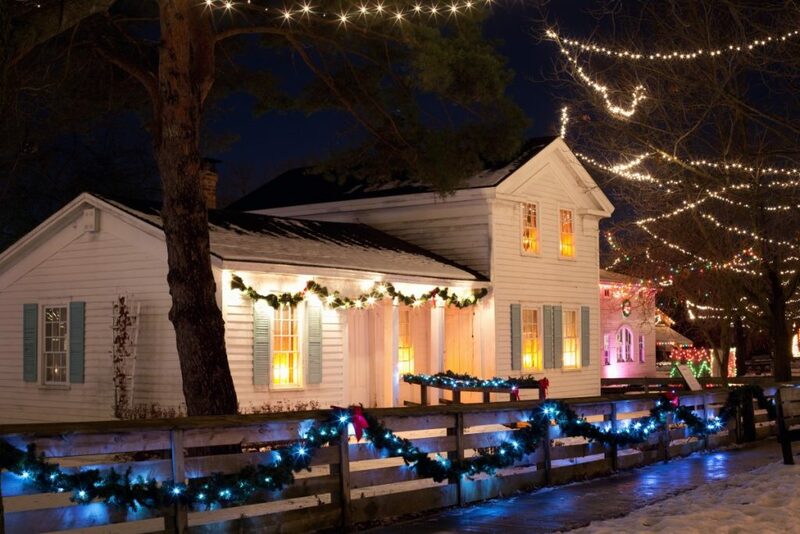 With reliable LED lights, they can be installed temporarily or as a permanent feature of the driveway with spotlights highlighting potted plants of the season or seasonal ornaments. At the foot of the driveway is a great spot to place over sized outdoor bows, wreaths or seasonal ornaments to welcome your guests with the spirit of the season. All of these decorative ideas not only highlight the garage and the driveway which is the first entry to the house, but it adds some practical benefits of lighting the driveway for more easily locating the driveway entrance on quieter streets. At the end of the season, most of these decorative ornaments and lights have to go back into storage until the next year. If you find that storing your seasonal decorations has become difficult to manage, start planning for a garage renovation and design which will create a garage storage system to help your family transition to the winter season, the holiday season as well as all the family activities which winter inspires. After months of cold weather, and still more on the horizon, we begin to look forward to the months ahead, when the temperature will slowly begin to climb. Perhaps your family is itching for warmer weather, ready to ditch heavy parkas and boots. However, your garage may not be quite ready for the coming change of season. During the winter, the last thing you want to do is schlep out to the garage to carefully sort and put things away. Therefore, it’s not uncommon for the garage to become the family dumping ground during the cold, winter months. If your garage is piled high with bikes, tools, outdoor toys, gardening tools, lawn care equipment, off-season tires and sporting goods, you’re probably unable to park all of your intended vehicles inside of your garage. Additionally, finding the items you need in a disorganized garage can be extremely frustrating. The impending arrival of spring signals the start of a variety of activities like softball, soccer, golf and gardening. All of these activities require specialized equipment which is likely buried in your garage. To avoid the annoyance and frustration of misplaced sporting equipment, gardening tools and lawn care equipment this spring, take the following three steps to get your garage ready for the change of season. The primary reason it’s so difficult to find anything in the garage is because the things we want and need are buried beneath items for which we no longer have a need. Think about the items currently stored in your garage. Has the garage become the designated dumping ground for broken toys, furniture and tools? 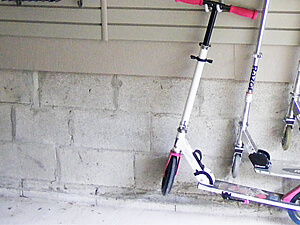 Is the garage littered with bikes, wagons and sports equipment the kids have outgrown? Are duplicates tools stealing valuable storage space? If so, prepping your garage for spring begins with a thorough purge. Sort through all of the items stored inside your garage. Be ruthless when it comes to cutting the clutter. Throw out items that are damaged or broken. Perhaps you stored them in the garage with the intention of fixing them. However, if those items haven’t been repaired in a year or two, the likelihood that they ever will be is quite slim. Donate or sell outdated items, those you haven’t used in years and items you’ve never used can either be donated to a local charity or sold. However, if you decide to sell unused items, set a firm deadline for getting rid of them. Otherwise, those items might still be taking up space in your garage three years from now. Group similar items and look for duplicate tools and sporting equipment. Once you identify duplicates, decide which item you’ll keep and donate or discard the unnecessary items. Purging the garage may seem like a daunting task for one person. Make the project fun by enlisting the help of family or friends. Turn on your favorite music. Once the job is completed, reward yourself with a night out or a fun activity the entire family will enjoy. If weather permits, it’s helpful to remove all items from the garage in order to clearly see the storage space available. 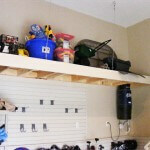 This will enable you to determine how to best use the space in your garage. Before you create the layout for your new, clutter-free garage, think about how you use the space. What tasks are performed in your garage? What kinds of items are stored there? Create distinct zones for sports equipment, lawn care equipment, vehicle care accessories and gardening tools. Put away out-of-season items, like sleds and snow shovels, to make room for items you’ll need for spring. Then decide on the ideal location for each zone: back wall, sidewall or near the garage door. There’s a limited amount of space in a garage. Yet, the volume of things we own and need to store continues to grow. How can you find a dedicated space to store all of your family’s things? Maximize the storage space in your garage by incorporating shelving, cabinetry, baskets, hooks and stackable storage containers. 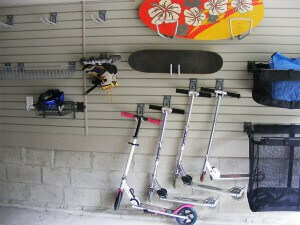 A garage wall organization system, like slatwall, is designed to maximize storage space. The complementary baskets, hooks and shelves slide and lock into place easily, creating a neat, organized system for storing items along the wall, rather than stacking them along the perimeter of the floor. Once the space has been optimized, each item can be stored in its designated space. 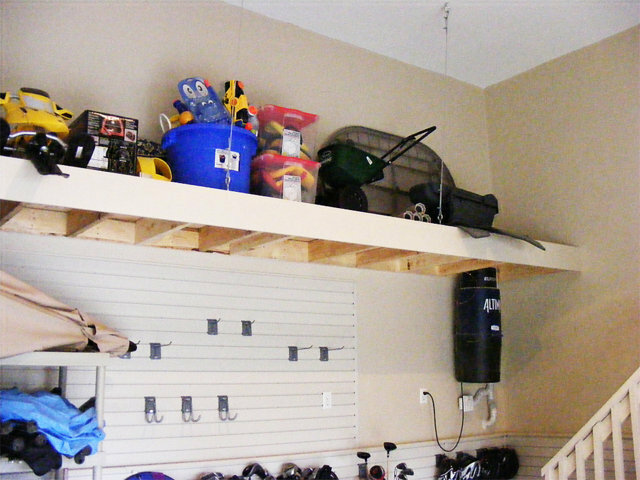 Shelving can be an essential component of an organized garage, particularly for those who prefer items stored where items can be easily seen and retrieved. Next time we’ll talk about how to maximize the storage space in your garage by using steel racks. If organizing your garage feels like an overwhelming job to take on yourself, check out some of our amazing garage transformations, then contact Nuvo Garage to request your free consultation. With the holidays quickly approaching, you’re probably still searching for a unique Christmas, Hanukah or Kwanza gift for that special person. If he or she enjoys spending time in the garage (or would like to), you’re in luck. We’ve got five gift ideas that will make your garage lover a happy camper. If the items stored in the garage have taken over, forcing you to park outside in the cold, give the gift of indoor parking space. Start by creating a viable plan for the space. Assess what you have stored in the garage. Decide what should be tossed (broken furniture, ruined paint, unusable items, etc.). Make a list of items than can be donated (furniture and sporting goods no longer needed, duplicate gardening tools, etc.). Then plan separate spaces for each type of item stored in your garage. For instance, create dedicated zones for automotive accessories, gardening accessories, sporting goods, etc. Determine if there is a need for additional storage space, like shelving. Make sure you have everything you’ll need on hand. Now that your plan is in place and you have all of the necessary tools, it’s time to take action. If the job seems too big to tackle alone, make it a family affair or invite a few friends over. Bundle up, clear space for a portable heater, turn on your favorite playlist and begin executing your plan. First, eliminate or relocate as many items as you can. Once the space has been pared down, you’ll have more room to operate. Move everything to the perimeter, making use of shelving, hooks and baskets that will allow you to store items vertically. Continue until you’ve cleared enough space to park inside your garage. Need a gift for a woodworking or gardening enthusiast? Consider creating a gardening or craft station inside your garage. A dedicated workspace for crafts and hobbies can be created relatively simply by re-purposing old furniture and cabinetry. First, determine where you want to locate the work area. Then reclaim the wall space by removing or relocating items. Next, create a flat work space. An old table or cabinet might do just the trick. If not, foldable workbenches or task desks are available at your local box store. When planning your workspace, don’t forget to provide adequate storage for tools and other accessories. If a sturdier workspace or heavy duty storage is needed, modular cabinetry might be the best option. Modular cabinets, like European-style Contur Cabinets, offer a clean, modern aesthetic and plenty of hidden storage. Need a unique workspace solution? 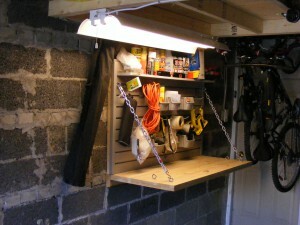 A garage renovation specialist can create a custom workbench. The amount of cherished items we own continues to expand, yet garage space remains fairly static. So how can you snag additional storage space for your loved one’s favorite things while conserving enough space to park your vehicle(s) inside the garage? Go vertical. Don’t limit storage to the perimeter floor space. Instead, find ways to store items along the entire height of the wall. This can be accomplished with a wall organization system, like slatwall, which makes use of complementary shelves, hooks and baskets to display items neatly and attractively. Heavy-duty shelving units, available at big box or wholesale stores, can also provide vertical space. Need even more storage space? Try looking up. 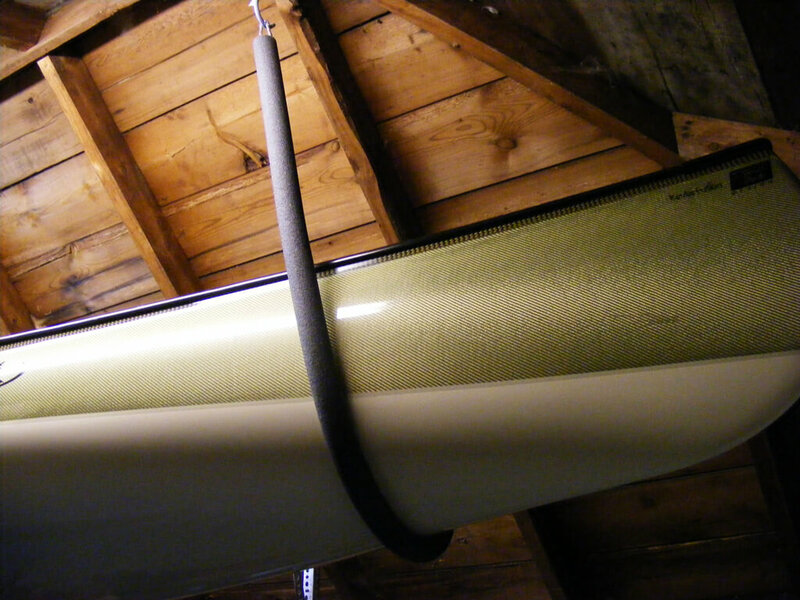 Overhead space is an ideal spot for storing cherished, but rarely used items, like seasonal decorations, and large, bulky items like canoes, roof rack storage containers or leftover siding. Active families can easily fill a garage with all of their sporting goods. Bicycles, golf clubs, skis, hockey gear, bats, balls, kayaks, snowboards, lacrosse equipment and other items jockey for space throughout the year. When not stored properly, expensive golf clubs, skis and other equipment can easily be damaged. Smaller items, like balls, knee pads and helmets are frequently lost. Protect your investment and save precious time by creating dedicated storage space to house the sporting goods of your athletes and weekend warriors. This can easily be accomplished with a wall organization system. Just add hooks, baskets and shelves to accommodate sporting goods. Then create dedicated baskets for each sport or family member. 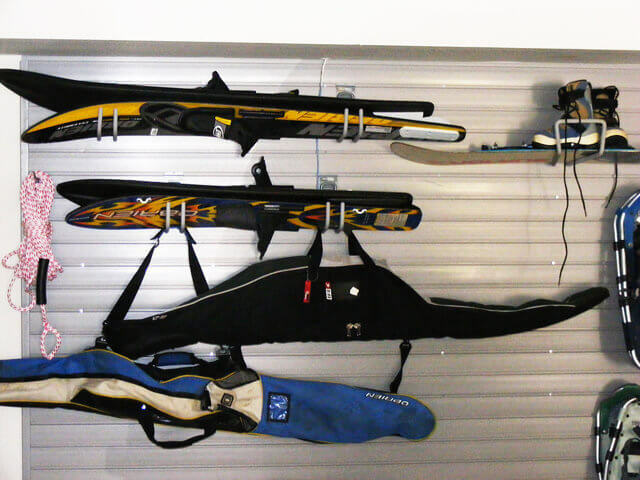 Many wall organization systems include storage solutions for specific sporting goods—like skateboard or kayaks. If organizing your garage seems overwhelming, or you’d rather have a professional renovate your space, consider enlisting the aid of a garage renovation specialist. Nuvo Garage specializes in garage transformations ranging from small organizational projects to major garage renovations. Contact us to discuss how you can give your favorite garage enthusiast the gift of a transformed garage space. With any garage renovation project it is fairly common to encounter situations that require a bit of creativity in order to set up the best storage solutions. These situations can be broadly classified into two main categories: those that involve movable objects or materials and those situations when it becomes necessary to work around appliances or other fixtures that are for the most part not readily movable. As you might expect, situations involving movable storage obstacles are fairly straightforward to address. On the other hand, storage obstacles arising from immovable storage solution obstacles need a bit more creativity and planning. However, as you will soon see there are options available for both. There are a few optimized storage obstacles that show up with any garage renovation project. Each of these must be handled with proper planning and foresight to achieve the optimized storage you desire. 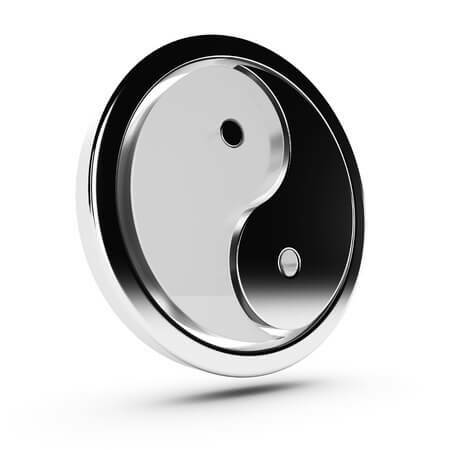 The most frequently encountered storage solution obstacle is the central vacuum. You may have noticed the central vacuum is often left hanging there on the wall taking up a lot of space. Most new home builders mount these central vacuums in the middle of a wall, either the back wall or one of the sidewalls. Also, the central vacuum is typically mounted about half way between the ceiling and the floor. While this position certainly allows you to access the unit for service, it makes storage above and below rather cumbersome. All of that being said, the central vacuum is actually an appliance that can be relocated relatively easily. The vacuum pipes coming to the central vacuum unit are simply common p.v.c plumbing and the electric is typically a standard outlet plug. Relocating the central vacuum merely means choosing an optimum location, mounting the unit and re-piping the vacuum lines as required. Oftentimes, the best location is found to be mounted in a side corner such that the unit is still accessible but it is mounted a bit higher and out of the way. 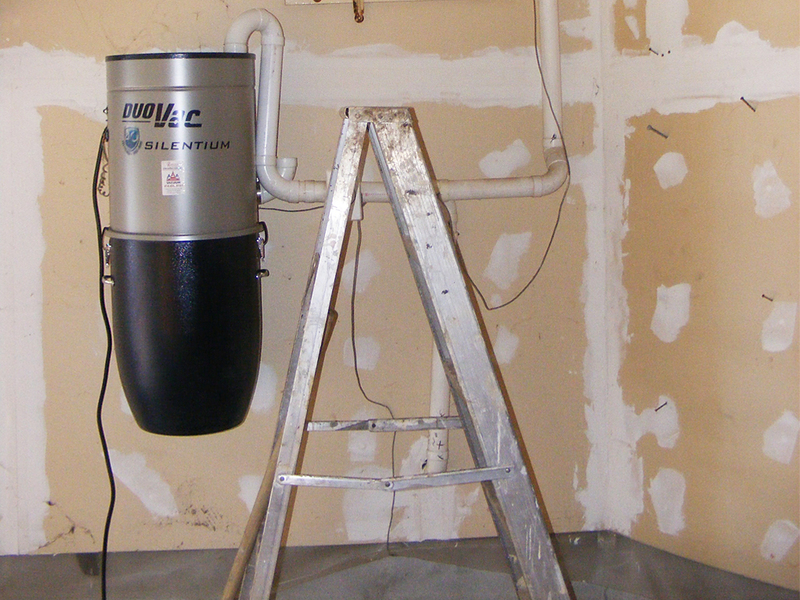 By relocating your central vacuum, you gain valuable storage space below and of course along the wall where the unit was originally located. For example, if you relocate a central vacuum stuck there in the middle of your sidewall to the back corner, now you have the option to install slatwall, storage racks or other optimized storage solutions in the newly freed up space. The next most frequently encountered obstacle to optimized storage is the doors and windows. Obviously, in most cases you aren’t going to be moving a door or window. On the other hand, there are practical storage solutions that can be installed to optimize the space. Start with the door into your garage from inside your home. The most obvious answer is to install an overhead storage rack. An overhead storage rack above your door will add valuable storage space that is useful, yet still out of the way. At the same time, you want to be aware of the fact that there is an optimum way to install an overhead storage platform and there is a sub-optimum way. The very best solution is to install an over the door storage platform using hardware hung from the ceiling. However, sometimes eager do-it-yourselfers will instead install this overhead platform and support it with vertical posts. While this is okay and does give you the overhead storage, the vertical posts can be an eyesore, not to mention getting in the way of other things you want to have in the garage. One other scenario to consider is when the door is located in the middle of the wall. In this case, more often than not a customized solution could be the best choice. For example, you could install a combination of overhead platforms, shelving or platforms on one side and slatwall on the other side. Of course each garage design is unique so many who chose to renovate their garages end up selecting a custom solution. Although windows are not really that common in most garages, customers with garage windows often are looking to optimize the space around the window. The one big issue is often the location of the window. In other words, if the window is in the middle of a sidewall versus being located towards one side or the other will determine the type of renovation options available. One typical storage solution option is the installation of an overhead platform with a slatwall installation to the sides and beneath the window. This option maximizes the utility of the space around the window while still allowing the full functionality of the window itself. A minor situation that sometimes shows up in garage renovation projects is the location of the fresh water hose bibb. The hose bibb may be installed in a location that means stretching an attached hose along the garage floor and outside. Some renovation customers may choose to have this hose bibb relocated further along the wall to a more convenient location. 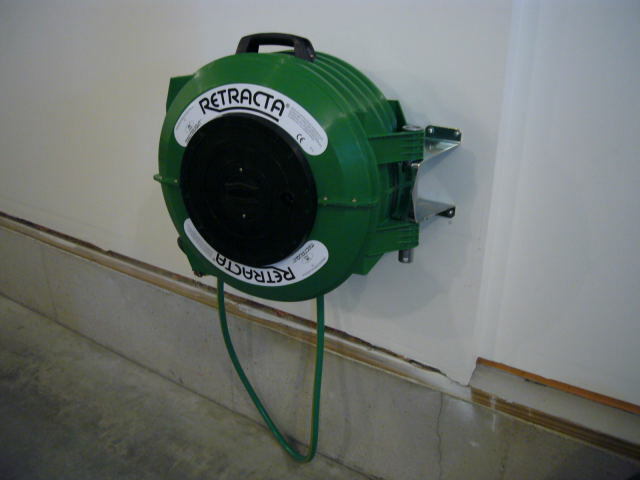 Alternatively, to save the trouble and expense of relocating the garage water supply, a more optimized hose reel and storage fixture can be installed. The hose reel can be conveniently mounted on the wall to allow easy access and storage. One final situation that might be a factor is the automatic garage door opener. 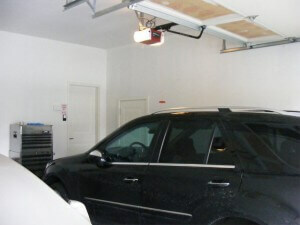 The garage door opener operates off of the normal household electrical outlets. Unfortunately, there is rarely an outlet mounted in the ceiling in a convenient location for the opener. Consequently, many homeowners end up draping an extension cord across the top of the garage and down a wall. Of course, this is not the best solution and is definitely not recommended. Keep in mind that an extension cord is only designed for temporary use; it is not supposed to be used as a permanent electrical supply. The solution is to bring in a electrician to mount an outlet close by the garage door opener. Absent wanting to install another outlet, the other option is to more permanently affix the extension cord with cable clamps or similar hardware. Conclusion: as you can see from the above, each and every garage renovation project presents its own challenges and surprises. However, with some simple planning along with a discussion of the best storage solutions for your situation you can have a garage that works for you. Can you and your garage pass the squeeze test? Is your garage causing you stress? As the season changes, many people find themselves faced with an unappetizing item on their plate, namely the garage and what could have been. During the warm summer months the very best of intentions were always there. Yet, somehow the task of organizing, of making sense of all that stuff in the garage never seemed to make it to the top of the to-do list. This chore kept getting put off to the next weekend, the next available Friday afternoon. Finally now we find the season change is upon us, and the garage is no better than it was at the start of the season. The summer ended so much faster than anyone planned on. Now you may very well feel like you have a monster on your hands. 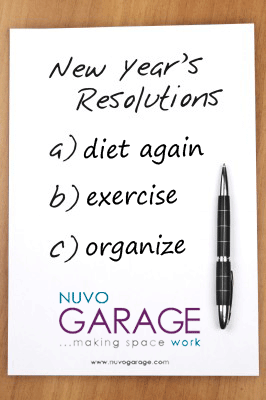 To help you come to terms with this, your friendly team here at Nuvo Garage put together a 7 point self-evaluation garage organization quiz. You can use this quiz to help you figure out where you are and what your best options are at this point. Relax, no one is going to grade this quiz so this is for your eyes only. This is just a fun way for you to find out how much you can or cannot squeeze into your garage and whether you experience what we affectionately call Seasonal Garage Anxiety Disorder. 1. Do you feel your blood pressure rising if you pause to consider your garage, the things that need to be moved in, the things that need to be moved out, the things that need to be shuffled around to prepare for the upcoming season? 2. Are you embarrassed to open up your garage door in front of your neighbors for the mess that’s readily visible to anyone that takes a peek inside? 3. If your garage door happens to be open and a friend stops by to chat, do you find yourself apologizing for the mess? 4. Does your car fit in your garage? Seriously, if you have a one car garage, will one car fit in there at the same time as all your stuff you have strewn about? Or, if you have a two car garage, can you comfortably park both cars inside without moving some of your stuff to one corner or the other? Also, whether it’s a one car or a two car garage, if the car(s) are parked in the garage, can you safely get to your car without stumbling over piles of your stuff? 5. Do truly know where your stuff is? If you suddenly need a pair of shears to trim the bushes out front, can you locate them without hunting all over the garage? 6. Do you actually know how much stuff you really have? You may be surprised to learn that during organization storage solution installations the team here at Nuvo Garage often surprises homeowners. These homeowners are shocked and amazed to learn there are duplicate or even triplicate tools such as snow shovels, rakes and the like strewn all over the garage. 7. How much time would you reckon you spend moving piles of stuff around to get to the tools or materials you are looking for at the moment? Well, there are your 7 questions. There is no real score per se, just a self assessment to help you figure out where you are. As you might imagine, knowing where you are is the first step to moving forward and making a better choice. So, take a look back at your answers. Your answers are a big clue for the next step, which as you might have already guessed is better organization. Of course, you are already aware of the value of a proper storage and organization solution since you’ve made it this far and to the end of the quiz. Now, one last thing, look back to your answers and ask yourself one final question: Is now the time to take some action and get organized? Achieving a really finished look that makes the garage an extension of the rest of your home means thinking about the interior design just as you would any other room. Instead of thinking about the wall, floor or organization as their own projects, think of the wall treatment as part of a whole design especially where the wall meets the floor. You can design the space simply by finishing the floors, adding some slatwall, baskets, racks, and hooks. Or you can transform your garage into a room that your family will enjoy using by designing a stunning space with cabinets, a workbench, or even a second level. Whichever route you choose, an important consideration will be where your floor meets the wall. You wouldn’t think of laying carpet or hardwood in your house and not finishing it with a baseboard. The same is true for the garage. And depending on the type of flooring and walls you have, baseboards provide protection from dust, dirt and water seeping behind the drywall or slatwall. When you’re choosing a baseboard, look first to what is on the walls and the floors. Wall protection is essential in garages where the drywall goes right down to the floor. Water can seep into the drywall at the bottom of the wall and cause crumbling over time. 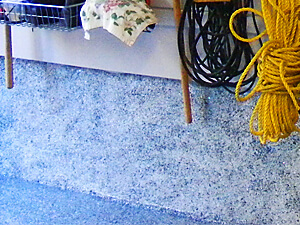 If your garage floor is PVC tiling, you can use 6-inch vinyl baseboards. The baseboard is glued to the wall and will protect against any water that may seep into the drywall, or under the tiles and create mildew. Polyaspartic flooring is always a great choice for any garage, but especially those with drywall that extends down to the floor. You can go with the standard 6-inch vinyl baseboard, or we can create a baseboard from 3/4″ plywood and then apply the polyaspartic flooring and continue it up over the wood to create a neat and unified baseboard. Drywall higher up can also be damaged from, spray from hoses, moisture from damp weather, or water dripping from skis, toboggans and tools. A wainscoting treatment protects against this and looks great too. 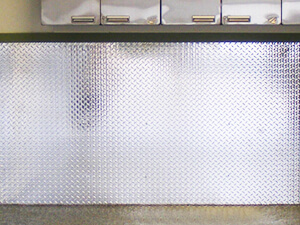 Punched aluminum wainscoting provides a modern industrial look that also provides great protection for the drywall. It can be used with any type of flooring. The walls are protected and the wall/floor joint is caulked to prevent any water seepage. Car enthusiasts love it because they can wash the car or spray down the aluminum and floors after using the garage as a workshop without fear of water damage to the garage or home. It also protects walls from damage when the car doors swing open inside the garage. Now, most garage floors are not level but sloped to allow water run off in the correct direction. Another advantage of using a wainscoting is the top can be leveled to the eye rather than follow the slope of the floor. When using an epoxy flooring, it’s best to install a simple vinyl baseboard. The product is too thin and will run if you try and apply it to a baseboard or a wall. It’s another reason why we recommend using polyaspartic flooring. For the small cost premium, it gives you so many advantages. The big decisions are important when designing your garage, but it’s the small details, such as baseboards and wainscoting, that really complete the look. It’s a new year and like many people, you’ve probably made, or are considering making, resolutions. Over the holidays, I did an unscientific survey of my family, friends and associates and confirmed some long-held assumptions – the most common resolutions are joining the gym, quitting smoking, eating better and getting organized. While the first three are out of my purview, in terms of getting organized, I can offer a lot more than moral support. The trick behind getting organized is picking a reasonable objective. Blanket statements like, “I want to organize my life,” can be daunting. It’s like going to the gym for the first time in two years and insisting on 30 minutes on the Stairmaster. In theory it might seem like a good idea, but you’ll soon realize incremental steps are the best, and least painful, approach. That’s why I like projects that are SMAC – specific, measurable, achievable and compatible. When it comes to getting your garage organized, it may seem like a big endeavour, but if you follow my three steps to ideal organization, it’s a lot easier than you think. And the results of a clean, tidy, organized garage are well worth the effort because it saves time and aggravation in the longrun. 1. Get rid of stuff you don’t want or need. Purging is the hardest part, especially with things you’ve had for a long time. The garage tends to be the dumping ground for things in the house without a real home. Really consider if you need it or are hanging onto it for sentimental reasons. I call this “just in case syndrome.” Remember your objective and ultimate resolution to get organized. When you’re clearing your closets, you don’t want to look at the skirt or jacket that’s been hanging there for the past three years and say, “I might need it.” It’s the same in the garage. Be focused and ruthless. You’ll be amazed how rewarding it is to give old bikes to programs that repair and recycle them, or if you have a variety of stuff, you can save it for a spring garage sale. 2. Divide your stuff into manageable chunks. Separate items by category like gardening supplies, power tools, sporting goods and automotive products. 3. Now organize your things according to themes, seasons or the way it’s used, similar to the way you’d group cutlery, dishes, baking accessories and food in the kitchen cupboards and drawers. Items that only are only accessed once a year like Halloween or Christmas decorations don’t need priority placement in the garage. Shovels, ice melting products and antifreeze are items you require frequently, so they should be stored in an easy to reach, logical spot. The idea is you shouldn’t have to think a lot when you’re looking for something in the garage or anywhere else. It should be intuitive. After purging and organizing everything in the garage, you might wonder how the standard four walls and minimal storage options can effectively make a home for everything. With a well-designed garage that’s custom tailored to your lifestyle needs, you’ll be able to sustain your organizing efforts and the garage will no longer be the dumping ground for clutter. So if you’ve resolved to get finally get things organized in 2013, I welcome you to call me for a free in-home consultation on how you can take your garage to the next level.